Russian scientists finally make their way into an Antarctic lake that has been sealed under the frozen surface of the continent for the past 20 million years. On Feb. 5, Russian scientists announced that they had pierced through 2.5 miles of Antarctic ice to access a unique sub-glacial lake, named Lake Vostok that has been sealed under the frozen surface of the continent for the past 20 million years. 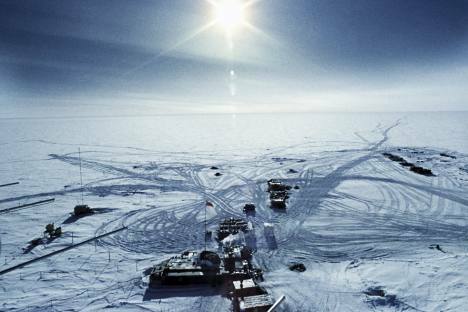 Russian scientists have been drilling towards the lake for two decades. Last year, they managed to drill within 35-50 feet of the lake when the weather in the area became too severe to continue the research. The scientists involved in the project say they have found “the only giant super-clean water system on the planet”. They predict that the extraordinary 1,300 cubic miles of pristine water will be “twice as clean as double-distilled water,” and are interested to discover what life, if any, the lake may hold, as it will have developed in total isolation. Geothermal heat under the ice keeps Lake Vostok liquid, and its conditions are often described as “alien” because they are thought to be akin to the subterranean lakes on Jupiter's moon Europa. “The discovery of microorganisms in Lake Vostok may mean that, perhaps, the first meeting with extraterrestrial life could happen on Europa,” said Vladimir Kotlyakov, Director of the Geography Institute at the Russian Academy of Sciences. Specialists at the Russian Arctic and Antarctic Research Institute will now test a sample of water that has been sucked from the lake and frozen to preserve its qualities. Priscu said that the crews had been working around the clock to finish the project before the Antarctic summer ended. When winter returns to the area, no planes are able to fly to the remote Vostok Station, where temperatures hover around -86 F even in the summer. Explorers from the United States and the UK are following in the footsteps of their Russian colleagues with their own missions to probe other hidden Arctic lakes, which are among the last of the world’s hidden and unexplored areas. The new discoveries unfolding at Lake Vostok have also breathed new life into an old theory suggesting that the Nazis may have built a secret base there as early as the 1930s. There is speculation that in the middle of World War II, some Nazis moved to the South Pole and started constructing a base at Lake Vostok. In 1943, Grand Admiral Karl Dontiz was quoted saying “Germany's submarine fleet is proud that it created an unassailable fortress for the Fuehrer on the other end of the world,” in Antarctica. According to German naval archives, months after Germany surrendered to the Allies in April 1945, the German submarine U-530 arrived at the South Pole from the Port of Kiel. Crewmembers constructed an ice cave and supposedly stored several boxes of relics from the Third Reich, including Hitler’s secret files. The combined report based on the information from the Daily Mail and RIA Novosti.